I was wondering what kind of topic would go here as there are no places or people I could find in Middle-Earth then I realized there was the journey/adventure that both Bilbo and Frodo went on. First there was Bilbo and his unexpected journey where he found the one ring and helped to take back a mountain from a dragon. Then there’s Frodo who went to Mt. Doom to destroy the ring. With both of them we have the good vs evil type story line but then we also have the tests of loyalty, friendship, and even family and those things are tested throughout both stories. I wonder sometimes what the story would have been like if Bilbo either hadn’t went on the journey or did but didn’t find the ring. What kind of stories we have had then. I think Bilbo was meant to find the ring and take it from Gollum. Frodo took on a quest that shouldn’t have been his to have to take but he felt responsible because it had been Bilbo that found the ring to begin with. Bilbo took his journey with thirteen dwarves and a wizard. Frodo took his with two men, a dwarf, an elf, three hobbits, and a wizard. Other than the wizard and the three hobbits everyone else were strangers to the two. My question for you is would you take a journey like Biblo and Frodo did with a bunch of strangers or would you play it safe and stay in your little hobbit hole? For such a cause, I’d go on the journey. 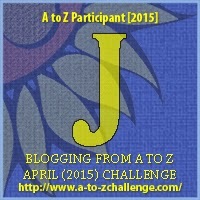 Happy A to Z! I don’t think either of them would have done it if they didn’t have friends among the group, and I would probably be the same! I prefer to stay home in comfort, but the whole point of leaving your comfort zone is to grow. I would take a journey like Bilbo and Frodo. Nothing new in the hobbit hole unless we had visitors. In some ways, the journey took them, and their companions came together for diverse reasons until they realised they had a common course. Just like any holiday tour group, really – where you meet interesting people, some you like, some you don’t really, and some who remain friends for a lifetime! That is true. Also, it’s kind of like going to camp as well for the first time and meeting your cabin mates. Some you’ll get along and become friends with and others you won’t.